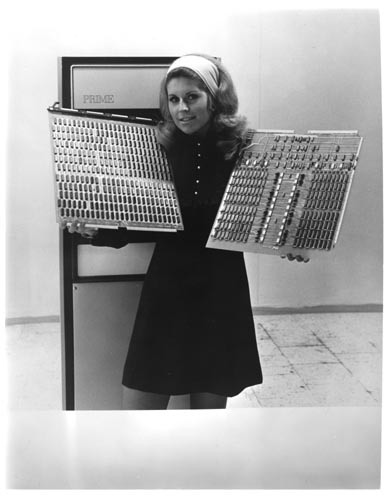 B&W image of a woman standing in front of a PRIME 200 holding two large boards used in the computer. Attached metadata: "Large-board packaging allows the entire central processor (CP) of the PRIME 200 to fit on a single 16-inch-by18-inch printed circuit board, left. The same technique, combined with the use of MOS semiconductor memory, also enables 8K of 16-bit memory to be packaged on a single board (right). The PRIME 200 chassis provides ten slots for the boards, providing for expansion of the basic 8K memory configuration. From: PRIME Computer, Inc. 17 Strathmore Road Natick, Mass. 01760 For Immediate Release Contact: Gabe D'Annunzio"